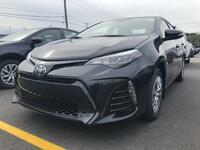 This outstanding example of a 2019 Toyota Corolla CE is offered by Saint John Toyota . You could keep looking, but why? You've found the perfect vehicle right here. This is the one. Just what you've been looking for. You've found the one you've been looking for. Your dream car. There is no reason why you shouldn't buy this Toyota Corolla CE. It is incomparable for the price and quality.